Are you looking for a reliable and convenient magnifier accessory so you can read tiny text, study maps, or do some soldering or repairs work in difficult conditions? 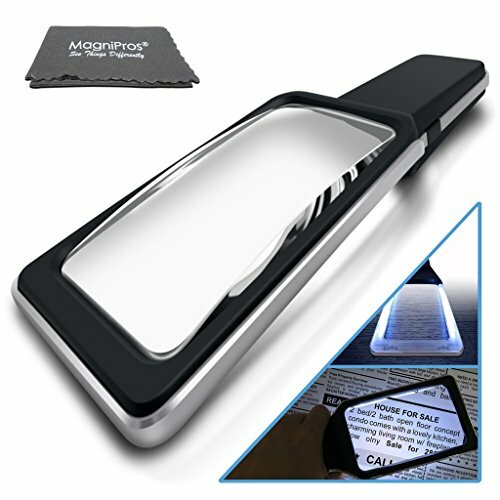 The LED magnifying glass from Magnified is designed to be the only magnifier you need. This particular accessory features a professional-grade optical lens mounted on durable ABS plastic that can withstand some rough handling. Get maximum value for your money with a handy, durable LED-illuminated magnifier! STYLISH, ERGONOMIC AND LIGHTWEIGHT MAGNIFYING GLASS FOR YOUR ON-THE-GO CONVENIENCE - are you looking for a stylish and sturdy magnifying glass that you can simply slide in your pocket and use on-the-go? Our magnifying glass is designed for jewelers, repair technicians, outdoor buffs, and just about anyone else who is looking to read or observe tiny detail text or parts. Get your handy magnifying glass accessory and easily read tiny text at home, or study maps while out there. 3 DIFFERENT MAGNIFICATION MODESSO YOU CAN ACCOMPLISH ALL YOUR TASKS - do you want to ditch your old-fashioned magnifying lens and upgrade to a new, modern accessory? The 3-LED light magnifying glass from Magnified will not disappoint. This particular tool has been equipped with three levels of magnification (3x, 10x, and 45x) so you can appropriately adjust its power depending on the specific circumstances. PROFESSIONAL-QUALITY OPTICAL GRADE LENS THAT LASTS LONG AND GIVES MAXIMUM VALUE FOR YOUR MONEY - are you looking for a professional-quality optical grade magnifying glass that is durable and lasts long? Our powerful magnifying glass is built to last, and thus provide maximum value for your money. Ditch those delicate, cheap-imitation magnifiers and go for an accessory that can withstand some rough handling. 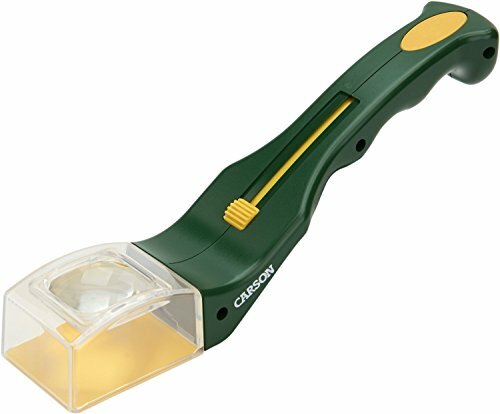 BATTERY-POWERED WITH 3 LED LIGHTS SO YOU CAN READ OR WORK ANYTIME - are you unable to use your regular magnifying glass in low-light conditions? Take advantage of our new magnifier that is equipped with three LED lights so you can read or work in low light conditions. This battery-powered magnifier is energy efficient so that you get more time for your batteries. With the LED magnifier from Magnified, you cannot go wrong! Wide rectangular magnifying lens shape the way we naturally read, it s ideal for reading books, newspaper and magazines and due to it s large viewing area(4.5 inch by 7 inch)you will enjoy minimal hand movement above the objects. THE MOST ADVANCED LIGHTING SYSTEM ON MAGNIFIER: This led magnifier is equipped with 12 SMD led lights which are covered by anti-glare reflector, therefore, lighting will be directed to an designated area without glare to your eyes, and provide envely lit viewing area. 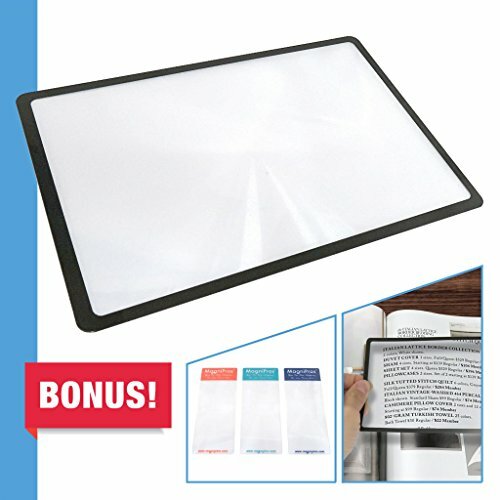 LARGE VIEWING AREA WITH CRYSTAL CLEAR LENS: Optical grade magnifying lens covers large viewing area without having your hands to move all the time, lens(viewing area) is measured 4.5x 7 and magnifies up to 300%. 12 ENERGY EFFICIENT SMD LEDs CONTROLLED BY DIMMABLE SWITCH: Our SMD LEDs are designed to last 100,000+ hours not only provide more evenly lit and brighter viewing area but consume less power than traditional LEDs so a new set of batteris would last twice longer. LIGHTWEIGHT & ERGONOMIC DESIGN: The unit itself only weights 6 ounces, and the grip of this LED magnifier is ergonomically designed for most hands,therefore, ideal for long reading time. BRIGHTEST & THE BEST READING MAGNIFIER:The brightness level peaks at 720 lumens, the brightest on the market, these LEDs are designed to last for more than 20 years without burning out or overheating. An adjustable head worn magnifying glasses with clear lenses designed for seniors, hobbyists and professionals. The 1X to 2.5X magnifying lenses are ideal for reading and handsfree applications like sewing and knitting, while the 3.5X lens is perfect for soldering, model building, coins, stamps, jewelry appraisal, watch and electronic repair. Switch lenses on the go. Just unclip to release the current lens from the headset and snap a new one in place. 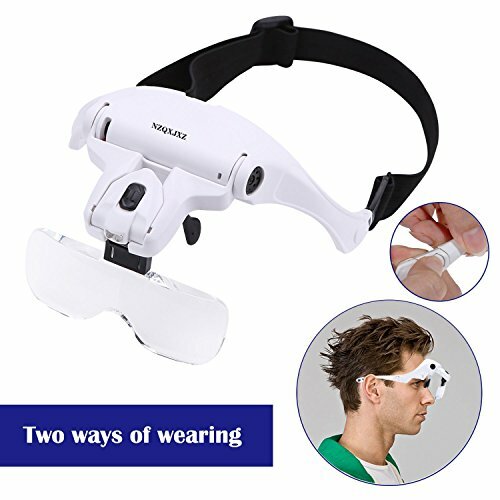 Comes with an attachable head strap to keep the glasses on your face at all times. Portable and tough enough to take with you wherever you go. The durable construction of our lenses and sturdy frame means you can take it with you when you travel. Equipped with two energy-efficient LED lights built into the glasses frame. The lights provide an evenly lit viewing area. The lights run on three AAA batteries. Backed by a 100% No-Hassle, RISK FREE Money Back Guarantee! If you are not completely satisfied with our magnifying glass, we will give you a full refund. No questions asked. Click the Add to Cart Button at the Top of this Page to start improving your vision today! COMFORTABLE AND STYLISH: You can put this head mount magnifier on your head like a pair of glasses. Ergonomic frame design. Mirror leg can be removed and changed to elastic band. This headband magnifier glasses has a very light weigh so that you would not feel any burdened or uncomfortable. VERSATILE: The individual lenses /magnifying lenses can be easily assembled and dismantled.Perfect headset magnifier for close up work like dentists,electricians,jewelers,sewing,crafts,beauty,painting and the elderly. DUAL HEADBAND WEARING MODES & ADJUSTABLE LED LIGHTS: Alternate between wearing it as glasses or headband. The included head strap can be attached with ease to ensure a more secure fit. The movable head magnifier lens slot can adjust the distance between your eyes and lens for different needs to ensure accurate irradiation of light source on the surface of viewed object ,making it more convenient in use. This magnifying glass lamp can be used as a headlamp at night. 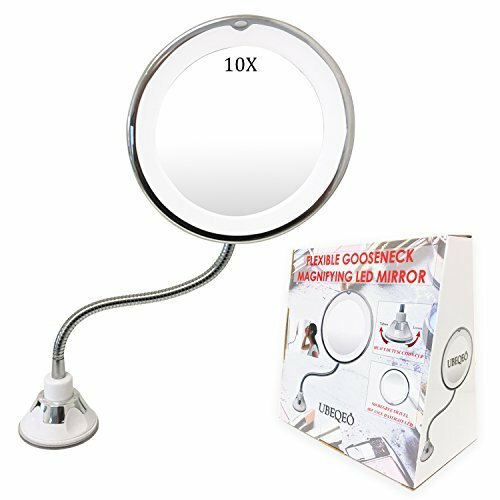 The 10X Magnifying Makeup Vanity Mirror With Lights LED comes with a 11.5 inch Adjustable Flexible Bendable Gooseneck. The 10X Magnified mirror makeup lights allows you to see every detail of your whole face so you can apply makeup flawlessly. It's also great for tweezing stray hairs, applying false eyelashes, removing makeup, or inserting contact lenses. A perfect makeup vanity with lights accessories and for wall mounted makeup mirror. The lighted mirrors LED has 40% brighter and 60% less energy than incandescent bulbs. Our Magnify mirror is equipped with energy-efficient Daylight LEDs that will gently illuminate your face without hurting the eyes or creating glare, providing you with bright, natural light for the most natural look. Innovative Locking Design Our proprietary Easy-Lock suction mechanism allows you to securely attach this mirror on another mirror or other flat surfaces in the bathroom. You can mount the mirror in less than 5 seconds. Simply attach, twist, and lock the mirror in place. Ultimate Portability You can easily detach the suction cup with a simple twist (to unlock). - This mirror requires a clean, flat and smooth surface of at least 3.5" X 3.5" otherwise the suction may not work. - Our mirror will adhere to surfaces such as ceramic, marble, acrylic, porcelain, enamel, and other mirrors. - Our mirror WILL NOT stick to surfaces such as drywall, wallpapers, stucco, or any textured walls. EASY VERSATILITY - Very flexible rotating swivel gooseneck that can be easily bend to get a closer distance with the mirror, adjustable height to get the best 360 degree viewing angles. PRECISION CLARITY MIRROR - The 10X Magnifying Mirror With Light is convenient for applying makeup with high accuracy. You can swipe a contour powder along the sides of your nose, along the forehead (near your hairline) and hollows of your cheekbones. Also, Apply blush to the apples of your cheeks, extending up toward the temples. The best makeup vanity with lights accessories and for wall mounted makeup mirror. NATURAL LIGHT - Advance technology 14 bright LEDs that will last more than 50,000 hours. Helps you to determine your real color of your skin tone and undertone. Figuring it out on your own can be easier than you think. With this high-end quality mirror where all women can reach their ideal level of beauty. HEAVY DUTY SUCTION CUP - Easy and quick locking suction cup to secure attachment to a smooth surface. It's design long enough adhesion to most surfaces but will not adhere to unfinished marble, porous or rough surfaces, or across grout lines. PORTABILITY - Perfect mirror for travel when folded. It's requires 3 AAA batteries for operation (not included). Made of high quality unbreakable frenel lens designed for people with low vision, seniors, hobbyists and professionals. The 3X magnifying lens is ideal for reading and inspection, it is perfect for electronic repair, and examining extremely small texts, images, and objects or even solar projects to start fire(must be under adult supervision)! You will receive two 7inchx10.5inch Full Page Magnifier sheets which can magnify up to 300%. The magnifying sheet is ideal for reading small print on maps, instructions or books and has the ability to magnify full pages, Handy 7inch x 10.5inch size lets you see full page for books, magazines, newspapers and maps. Backed by a 100% No-Hassle, RISK FREE Money Back Guarantee Offered by MagniPros! If you are not completely satisfied with our magnifying glass, we will give you a full refund. No questions asked! NON-TOXIC & UNBREAKABLE MATERIAL: The lens is made out of optical grade PVC a superier material than other fresnel lens, which provides crystal clear image quality with minimal distortion, pefect for seniors with aging eyes and low vision individuals. 3 BONUS BOOKMARK MAGNIFIERS: Each package comes with 2 page size sheets and 3 bonus bookmark magnifiers, due to it's compact size, its east and convenient to bring them with you so you will alwyas have extra set of eyes. LIGHTWEIGHT & PREMIUM MATERIAL: All the lenses are made out of Unbreakable & optical grade PVC, the largest one only weighs 1 ounces and it is Ideal for longer reading time, because of the weight advantage you will be able to hold it with minimal fatigue. LARGE VIEWING AREA: The Large US letter size magnifying sheet is measured 7 X 10.5 in viewing area which covers and Magnifies an entire page at once without having you to reposition it all the time as the other smaller magnifiers. Suffer from Macular Degeneration, Life will change! Dicfeos 3x magnifying glass will be the best companion to help seniors enjoy morning papers, read prescriptions and get the crystal clear vision again! 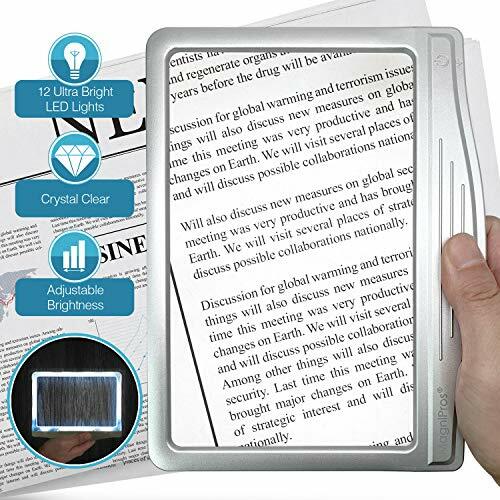 The magnifier itself is handy and lightweight, which will be the best handheld book magnifier! Made of high quality frenel lens designed for people with low vision, seniors, hobbyists and professionals. The 3X magnifying lens is ideal for reading and inspection, it is perfect for, electronic repair, and examining extremely small texts, images, and objects or even solar projects to start fire(must be under adult supervision)! You will receive one Page Magnifier and three BONUS bookmark magnifiers in the package. The magnifying sheet is ideal for reading small print on maps, instructions or books and has the ability to magnify full pages, Handy 4.5inch x 7inch size lets you see full page for books, magazines, newspapers and maps. IDEAL FOR EVERYDAY USE - Great for full page magnifier visual aids, fresnel lens solar projects, fire starter survival tools, and other daily house chores. 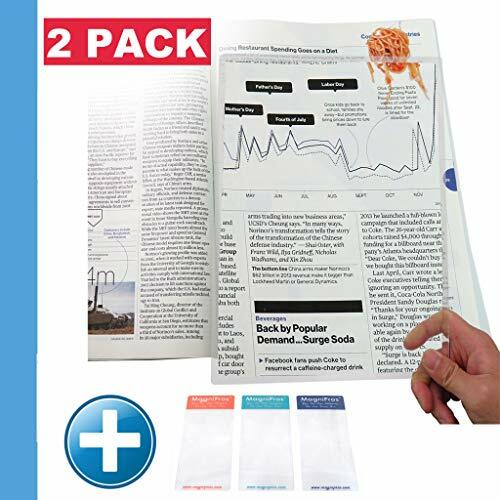 EASY READING - The magnifying sheet is ideal for reading small print on maps, instructions or books and has the ability to magnify full pages, Handy 4.5 x 7 size lets you see full page for books, magazines, newspapers and maps. PREMIUM QUALITY - Our page magnifiers are thicker than most and PROVIDE GREAT MAGNIFICATION to produce top notch image clarity. DURABLE & MOBILE - Made out of flexible PVC material with a reinforced edge. It's lightweight and won't break. LIFETIME GUARANTEE - We know you are going to love your page magnifier fresnel lens so if you're not satisfied, we'll refund your money. THE MOST COMFORTABLE LIGHTING SYSTEM FOR YOUR EYES: This led magnifier is equipped with 12 anti-glare SMD led lights, which provide more evenly lit area than traditional LEDs, lighting does not focus on one point rather scattered within an area. 12 ENERGY EFFICIENT SMD LEDs CONTROLLED BY DIMMABLE SWITCH: Our SMD LEDs are designed to last 50,000+ hours not only provide more evenly lit and brighter viewing area but consume less power than traditional LEDs so a new set of batteris would last longer. LIGHTWEIGHT & ERGONOMIC DESIGN: The unit itself only weights 7 ounces, and the grip of this LED magnifier is ergonomically designed for most hands,therefore, ideal for long reading time. BRIGHTER & BETTER FOR YOUR EYES: These SMD LED lights are 35% brighter than traditional leds while consume 50% less power/energy, therefore, a new set of batteries will last longer. A magnifying glass can come in handy when you are reading the fine prints in a book, doing close-up work with your favorite hobby or completing tasks where precision matters. You can even use it to make out small text on those pesky pill bottles. With 2 different levels of magnification at your disposal, the BearMoo Magnifier Set is a true must have for people with low vision, hobbyists, and professionals. Crystal Glass Lens creates good levels of clarity comparing with common acrylic lens, with Prevention from spinning wounded. 3X magnification is well designed for seniors, students, professionals, people with low vision and macular degeneration. 45X magnification is perfect for examining extremely small texts, images, and objects. The bright light shines on what you are reading, so you don't have to move around to find light and hold the glass just right to focus. The batteries are very convenient to change even someone with limited hand mobility could change them. Different magnifications have different focal lengths. The focal length of this 3X magnification magnifier is about 1.2 inch to 3.1 inch (30mm-80mm). If the focal length exceeds about 3.1 inch, image and text may be distorted. Comfortable handle with only 5.8oz Weight. No more suffering arm fatigue when reading for a long time. High Clarity With Crystal Glass Lens: with hard and anti-scratching feature, this 3 inches quality glass lens (3X+45X magnification lens) makes superb quality image without distortions.Please pay attention to close to the point slightly which can prevent from upside down. 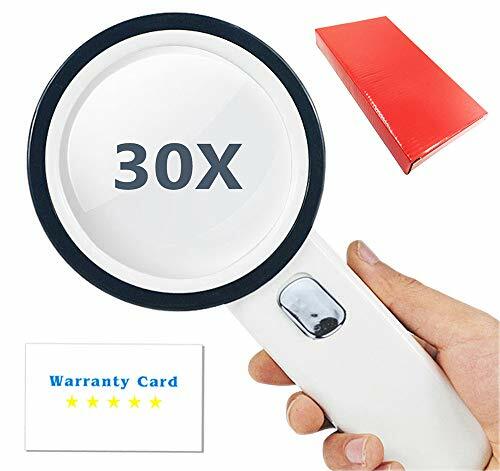 Well Made Magnifying Glass: Solid well built with quality ABS plastic, finish surface without any sharp edges, stylish and portable light weight design. Easy To Use With Nice Led Lighting: The light is nice and bright with 3 LED lights that provide good illumination. Eco-friendly and energy-efficient lights ensure an evenly lit viewing area [no batteries included]. Easy To Hold With Comfortable Handle : Ergonomic construction gives it a good balance and a comfortable grip, make you feel not too heavy or too light. Longer life span, they would last 100,000+ hours without burning out or overheating. Made of scratch resistant, shatterproof acrylic lens which is lighter and more shatter-resistant than glass lens and provides crystal clear, distortion-free image designed for people with low vision. The wide horizontal magnifying lens is ideal for reading, it is designed to simulate the way we naturally read from left to right, it is perfect for someone who loves to read! Equipped with 10 DIMMABLE & Energy-Efficient SMD LED lights built surrounded the frame, brightness can be adjusted from 0% to 100% with knob switch. The lighting emits from semi transparent reflector creates an evenly lit viewing area without glare to your eyes, perfect for nighttime book reading and use in low light applications. Each unit comes with a convenient storage & cleaning cloth. RECTANGULAR SHAPES THE WAY YOU NATURALLY READ: The rectangular lens is especially design to simulate the way we naturally view things from left to right, the magnifying lens covers large viewing area without having your hands move all the time, lens is measured 4.35"x 2.7" and magnifies up to 300%. 3X+5X DUAL MAGNIFICATION LENS: Made out of optical grade acrylic which is lighter and more scratch-resistant & shatterproof than glass while provides the same clarity level. The large rectangular main lens can magnify up to 300% while the smaller bifocal lens at the corner can magnify up to 5x(500%) for detalis- It is perfect for reading/viewing small prints Map, Newspaper, Magazine and also great for eye conditions such as aging eyes and macular degeneration. 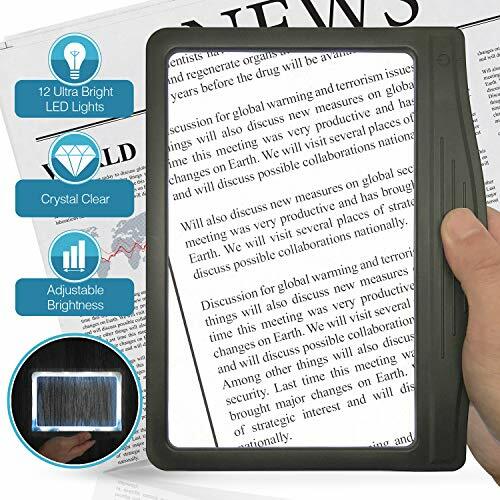 REDUCE EYE STRAIN & DIMMABLE LIGHTING : This led magnifier is clinically proven to be ideal for anyone who strains their eyes to see words on a page because it magnifies and provides light without glare. The roller dimmer allows you to easily adjust the brightness level(peaks at 600 lumens) with the tap of a finger to achieve the perfect lighting for various tasks. LIGHTWEIGHT & ERGONOMIC HANDLE: Thanks to the special design premium lighter lens it only weighs 6.5oz, in addition, the handle of this LED magnifier is ergonomically designed to grip/hold comfortable for most hands, making it ideal for anyone who loves to read for longer period of time. 10 ENERGY EFFICIENT & LONG LASTING SMD LEDs: Our SMD LEDs are powered by 3 AAA batteries(Not included) and are designed to last more than 100,000 hour. They provide more evenly lit viewing area, our LED lighting will last for more than 20 years without burning out or overheating. Save money and energy while enjoying long lasting bright light. and hobbies like model building, jewelry design, soldering and so much more! Use the 5x power spot Loupe lens for examining more fine and intricate details like studying coins, stamps, threads, etc. 3.When plotting scale base is not needed,You can remove the square base under pressure for further use of product. you move it!No wobbles, no worries. Best of all, you can adjust on the fly quickly without loosening . 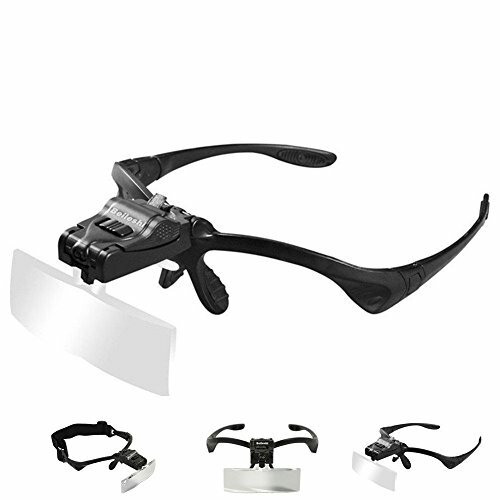 We make our reading magnifier lens from genuine diopter glass while cheaper units only paste full page magnifying sheets onto ordinary glass. Our high-quality 5.5" diameter lens magnifies tasks while eliminating eyestrain. Backed by a 100% No-Hassle, RISK FREE Money Back Guarantee! The MagniVisor Deluxe (CP-60) from the Carson PRO Series is a hands-free, head-worn magnifier included with 4 precision cut interchangeable acrylic lenses: 1.5x, 2x, 2.5x and 3x power magnifications. Once clipped onto the headset, the lenses can extend up to about an 85 degree angle if they are not needed for magnification. The MagniVisor Deluxe includes an adjustable headband with a quick release button which allows for smooth and easy adjustments for different head sizes. The LED lighted lamp (3 super bright lights) adjusts to about 30 degrees to right or left and about 90 degrees up and down to allow for adjustable lighting exposures. The LED lamp can also be used as a removable, free-standing light source as it contains a magnetic base. The LED lights are powered by 3 AAA batteries (not included). The MagniVisor Deluxe head visor magnifier is perfect for all hobbies, crafts, reading books, magazines, newspapers, model building, jewelry design and other low vision tasks! It is a great option for jewelers, coin and stamp collectors, hobbyists, watch makers, small electronics, arts & crafts, sewing, knitting, auto mechanics, soldering, seamstresses along with so many other low vision needs. The MagniVisor is lightweight, comfortable and has an ergonomic design. It can be used to fit along with reading glasses as well. The MagniVisor Deluxe is backed by Carson s limited lifetime warranty. At Carson, we strive to make sure our customers are 100% satisfied with the quality of our magnifiers. We are so confident in our magnifiers that we back them with a Lifetime Limited Warranty! Carson will repair or replace your magnifier if it is found to have manufacturing defects in materials or workmanship. Please contact Carson for additional warranty details. Includes 4 precision cut interchangeable acrylic lenses with multiple magnifications (1.5x, 2x, 2.5x, 3x) | Lenses included with microfiber cleaning cloth and a protective case. 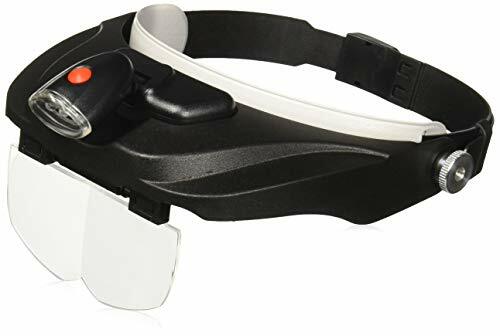 Lightweight and comfortable hands free head worn visor magnifier for everyday use | Great for hobbyists, arts and crafts, jewelry design, model building, reading, inspection and other low vision tasks. 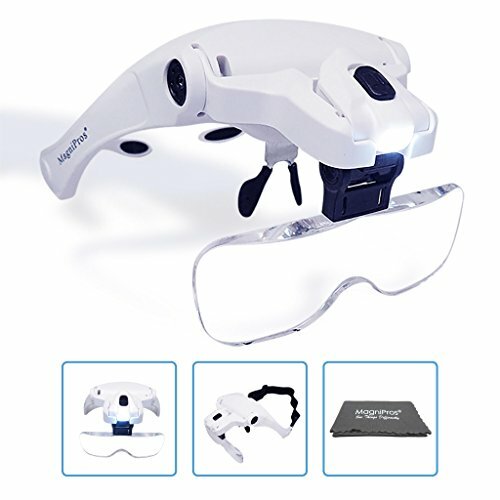 This is a adjustable led headband magnifiers that it is very comfortable to wear and providing afford 5 interchangeable lenses designed for seniors, hobbyists and professionals. repairing electronics, cataloguing coins, help produce small precise handicraft workers reduce eyestrain appreciating flowers/potted landscapes etc. while the 3.5X lens is perfect for soldering, model building, coins, stamps, jewelry appraisal, watch and electronic repair etc. 1.If you are not satisfied with our product or have ordered a wrong item. Note: Please buy products sold by sumcoolshop, please be careful with all non-brand merchandise. HIGH DEFINITION AND NO DISTORTION: The individual lenses /magnifying lenses can be easily assembled and dismantled.5 different sizes of head magnifier lenses can meet your different needs. MORE COMFORTABLE TO WEAR: You can put this head mount magnifier on your head like a pair of glasses. Ergonomic frame design. Mirror leg can be removed and changed to elastic band. This headband magnifier glasses has a very light weigh so that you would not feel any burdened or uncomfortable. HIGH QUALITY AND ADJUSTABLE LED LIGHT: The headband magnifiers has a lamp with 2 high quality LED. The movable head magnifier lens slot can adjust the distance between your eyes and lens for different needs to ensure accurate irradiation of light source on the surface of viewed object ,making it more convenient in use. This magnifying glass lamp can be used as a headlamp at night. EASE EYE STRAIN: The acrylic optics lens of magnifying eyewear can help you see objects easily. Easing your eye strain while working long hours and free your hands. VARIOUS USAGE: Perfect headset magnifier for close up work like dentists, electricians, jewelers, sewing, crafts, beauty, painting and the elderly. The black LightView PRO Colors Edition Magnifier Table Lamp comes strongly recommended for anyone facing challenges due to macular degeneration. The 5-diopter magnifying lens brings an entire page into focus - there's no need to move a book or newspaper around as you read. Ideal for use as a craft lamp, LightView PRO lets aging eyes see intricate embroidery close-up once more! Best of all, it's dimmable and it's adjustable for direction as well as color intensity. The flexible neck pivots to reach up, down, and side-to-side at angles that best suit your height comfort, as a bi-touch dimmer lets you select your desired lighting level. The most innovative feature, however, may well be a color adjuster on the lamp head. If the full brightness of cool white color feels too harsh on your eyes, LightView PRO Colors Edition gives you a choice that lesser lamps don't provide. Now, you can have it both ways. When you need daylight bright lighting to see every detail, opt for the color temperature of 6,000 Kelvin. For those times when you prefer softer lighting, select the more soothing warm white of 3,000 Kelvin. You can also adjust the color level anywhere in-between 3,000K - 6,00K. Dimmability feature also allows you to adjust the brightness level. We make our Magnifier lens of genuine diopter glass; cheaper units only paste plastic magnifying sheets onto ordinary glass. Brightech's high-quality 3-inch diameter lens magnifies 2.25 times - eliminating eyestrain for elderly readers. There are less expensive magnifier lamps out there, but none of them has the quality or workmanship of a Brightech lamp. None of them has the vivid daylight hues of power-bill-saving LED. The 90 LED lights embedded here use only 9 watts altogether - a model of efficiency! 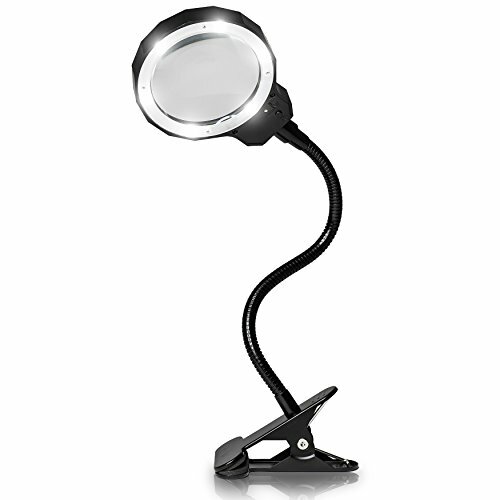 BEST LED MAGNIFIER LAMP FOR READING & CLOSE WORK. COMFORTABLE, UNLIKE MAGNIFYING GLASSES / HEADSETS: Enjoy newspapers and books even with vision problems such as ageing eyes or macular degeneration. The 5 inch diameter lens, with a 9 inch focal point, is made of genuine diopter glass - scratch, warp & heat resistant unlike cheap acrylic magnifiers. It magnifies up to 225% (2.25X). HANDS FREE SEWING & CRAFT LIGHT WITH STAND. GOOSENECK -LIKE SWING ARMS SET & KEEP MAGNAFYING HEAD IN PLACE - Forget handheld! Arts & hobbies such as knitting, cross stitch, quilting, painting, & drawing become more enjoyable when you can use both hands, plus notice fine color contrast & count small stitches. The cool white light helps your eye see contrast like in natural daylight. 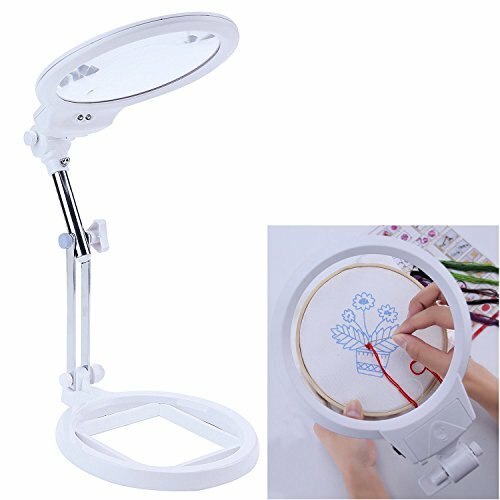 MAGNIFYING GLASS ESTHETICIAN LAMP FOR FACIALS, EYELASH EXTENSIONS, MICROBLADING - Makeup artists and beauticians: do you need to work close up, precisely to make your clients look beautiful? It couldn't be any easier to shape an eye brow just right when you can see it brighter and magnified. TABLE LAMP WITH TOUCH SWITCH DIMMER & COLOR ADJUSTING LEDS - 20,000 HOUR LIFE, ENERGY SAVING: The 9 Watt integrated lights produce 650 lumens. Focused on one spot, this is very bright. Dimmable and you can adjust the light color (6000K cool white to 3000K warm white, & in between) with built in buttons. LED saves energy vs halogen, CFL, or incandescent lighting & doesn't heat, so your hands don't get sweaty or burnt by accident. SATISFACTION GUARANTEED WARRANTY ON OUR MODERN, TABLE TOP VISE CLAMP LIGHTING: We proudly stand behind all of our products 100%, which is why we offer a full 3 year warranty. If for any reason you are not satisfied with your purchase, please contact us because our number one goal is customer satisfaction and we are committed to making it right for you. 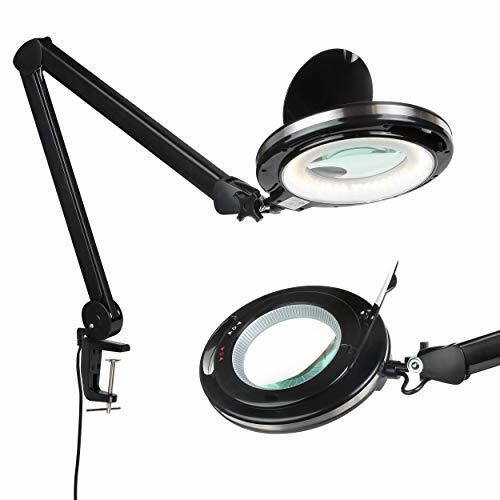 The Fancii lighted magnifier lamp comes with a 3.5 inch 8-diopter optical glass lens. The 3X magnification, with a focal range of up to 7 inches, allows aging eyes to see intricate details and fine prints with amazing clarity. Delve into your favorite hobby and craft like sewing, knitting and crocheting without eyestrain. Equipped with energy-efficient Daylight LEDs with 3 different levels of brightness, our desk lamp will provide you with vivid and glare-free images under any lighting condition. It is 30% brighter and uses 60% less energy than traditional incandescent bulbs. Drawing on less than 9 watts, our energy saving 6-LED lamp lasts up to 50,000 hours. No need to change the bulb! Up to 6 hours of powerful, non-diminishing brightness from the included premium rechargeable 200mAh battery. Recharge in just 6 hours with a wall adapter or power bank (not included) and the included Micro USB cable. Our Easy-Flex gooseneck design give users the freedom to adjust to any desired height and positions. The heavy-duty non-slip grip metal clamp will attach firmly to any desk, table, or ledge (clamp opens to a maximum of 2 inches). The detachable aluminum handle allows you to switch between a magnifying lamp and a handheld magnifier. At Fancii, we believe in our products. That's why we back them all with an 18-month warranty and provide friendly, easy-to-reach support. 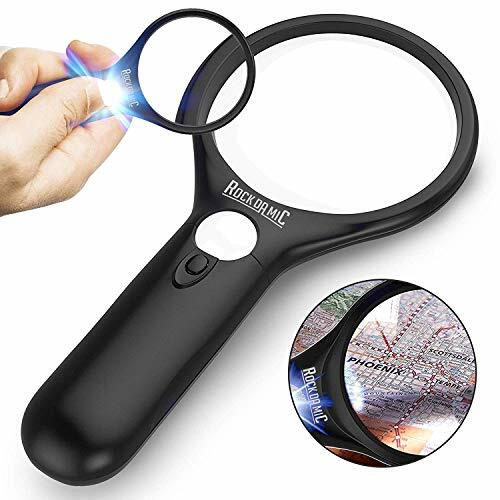 No Longer Have to Squint at Things - Give this magnifying glass with light as a gift to your elderly grandparents or parents, this is exactly what they need and they will like it very much. Explore the Mysteries of Nature - Give this magnifying glass to your children, satisfy their curiosity, expand as an extracurricular, and accompany them to observe the plants or small insects they are interested in. Large Field of View - The effective diameter of the lens reaches 3.4 inches, when you reading books with this magnifier, you don't need to move the lens frequently. 30X Magnification - This lighted magnifier uses a double-layer lens combination arrangement, actual optical magnification of up to 30X, help you see the details of things more clearly. 12 LED Lights - Give you bright light for easy reading even in pich dark. Humanized - Ergonomically designed magnifying glass handle reduce palm and arm fatigue for long periods of use. Battery - This magnifying glass with light require 2 AA batteries, not included. Customer Service - The XYhdlql brand is registered with the US Trademark Office and is protected by US law and Amazon policy. This magnifying glass is Sold by XYhdlql and Fulfilled by Amazon. Itspacking list includes a magnifying glass, a microfiber cleaning cloth, and a warranty Card, and we will provide you with a quick response and continuous friendly after-sales service. PROFESSIONAL LENS - The lens of this magnifying glass is made of high-quality optical glass, its more clearer than plastic magnifier lens, and more scratch resistant. The diameter of the magnifying glass lens is 3.4 inches, giving you a large field of view. 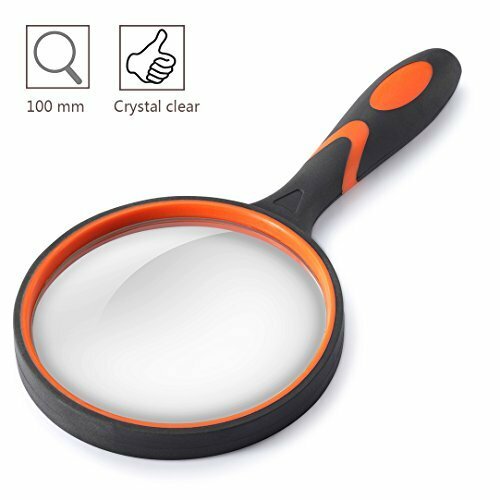 HIGH POWER MAGNIFICATION - This lighted magnifying glass uses a double-layer lens combination arrangement, actual optical magnification of up to 30X, even a very small print can also be enlarged to see clearly, this is very helpful for people with low vision, they no longer have to squint at things. BRIGHT - 12 LED lights surround the magnifier lens, give you extra bright light light to make sure you see more clearly in low light but not glaring, helps reduces visual fatigue, which is very useful for people with macular degeneration. MULTIPURPOSE - This magnifying glass with light is very suitable to useIdeal for viewing fine details in books, newspapers, stamps, old photos, antique coins, maps, family payments, instruction manual, jewelry, pill bottles, hobbies and crafts. Also suitable for students' classroom science and children's natural exploration. EASY TO USE - Just need to load 2 AA batteries and turn on the switch(batteries are not included ), then you can works with the magnifying glass. This magnifying glass is a great family gift for the elderly or kids, this is exactly what they need.